I have wanted a foundry for some time. I thought I would start with the burner. source for good clean oil. a kwiky burner for comparison. then used the filter in the coffee pot. fuel line but I do not have the proper size compression fittings. I felt the oil was getting too hot. valve right at the burner. A broken upright vacuum provided all the parts for a 2 inch blower. If you type 'turk burner' into google you will find lots on these things. seems to be critical in getting the burner to light. I have not found the right spot as yet. as vtsteam did. This did not work well as it did not siphon. I made another one of 1/4 pipe. This works much better. affects this. Am going to play with the adjustment tomorrow. lots of adjjusting but not the details of the burner. I reviewed the pictures DavidA posted. I found one that was similar to the venturi burner. I tried posting its address but it took a half of a page. 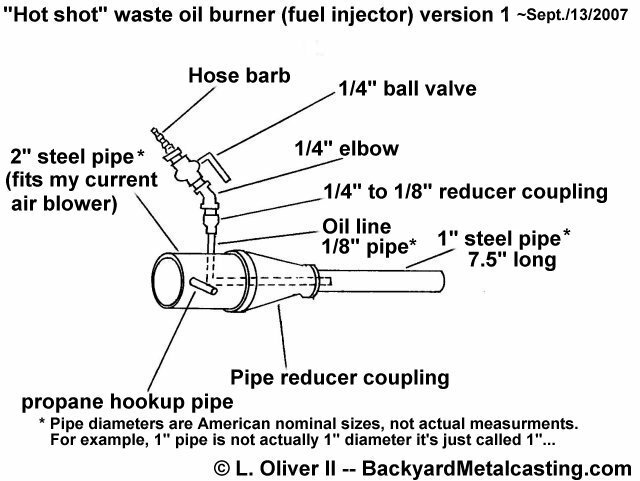 burner with room temperature oil. another nozzle with a longer hole but it made no difference. nozzle is from the mig tip as vtsteam mentioned. in the flame and the heat. I will try the blower again. Need to move this operation outside. it will melt case iron. a supply of waste oil. adjustable handle so the nozzle could be positioned while burning. the oil line, A collar and a washer provide the correct spacing. 6 holes around it as I did not know the correct position when assembled. Drawing of a similar burner.